Can you believe mid-August has already approached? I cannot believe how fast this summer has gone by so far. Basically I am soaking up as much of the summer sun as I can. 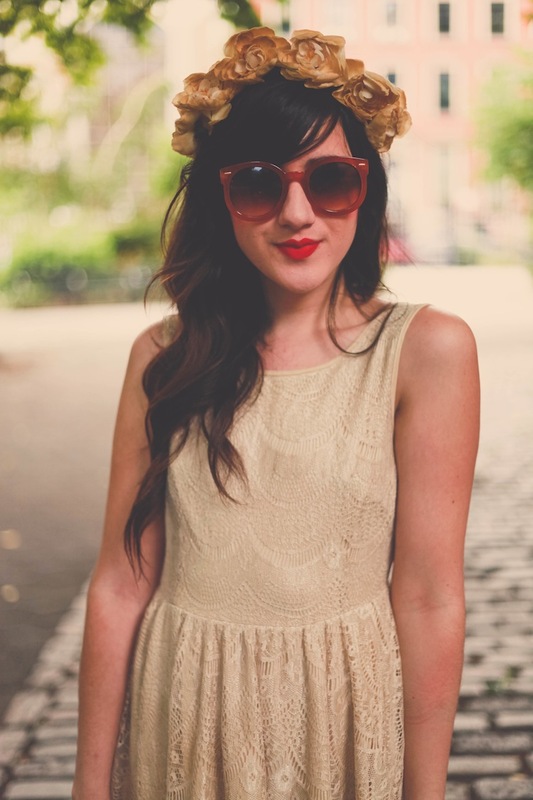 Here I chose bright accessories to liven up this dreamy cream dress. Anyway, today is my best friend's last day in the city and I took the day off work, so we plan on spending the day adventuring as much as we can! A beach day at Coney Island is most likely in the works. Super adorable! That flower crown really looks perfect! I LOVE your dress! You look absolutely lovely. Have a wonderful day with your friend! This dress is wonderful <3 and you are so beautiful, aw ! Love this dress! I love the way you styled it with the bright accessories. Hope you have a fun last day with your friend! You look adorable! And I love those cat flats & your lipstick. Where's it from? That is the cutest dress! I just love the lace! i love a lace dress!! so pretty! August has gone by so quickly! I love this dress––so nicely paired with red lipstick :) The trip you're planning sounds lovely. I love this outfit and your style in general! Gorgeous dress. Your hair looks incredible too, is it naturally wavy? your photos are always so lovely. love that dress and the flower crown is gorgeous. so sad that your friend has to leave but hope you have a great time today. Love the back on that dress it's so so so cute! you are such an adorable flower child! love those sunnies and the open back on that dress! love the dress but LOVE the bag... the color! Lovely! :) I need a bag with bright color! I love so much your blog and your style!